The Honda Accord has been fully revamped for 2016. Find out what the experts from Edmunds.com have to say. It’s big news any time one of the best-selling vehicles in America is the subject of a refresh. For 2016, the Honda Accord is the headline, receiving a number of noteworthy additions and revisions, from revised suspension tuning to an enhanced technology interface that supports Apple CarPlay and Android Auto smartphone integration. Add these upgrades to a sedan that is already an Edmunds “A” rated car and you’ve got the recipe for one of the best family sedans on the market. From the outside, the most obvious changes to the 2016 Honda Accord are its revised front and rear fascias, grille, taillights and (on Sport and above trims) LED foglights. 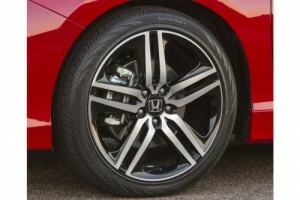 All Accords get new wheel designs, while some trims roll on slightly larger rubber. Improvements continue inside, with an enhanced touchscreen interface that uses both Apple CarPlay and Android Auto smartphone integration programs, a first for Honda. Simply connect an iPhone or Android phone to the infotainment system via a USB connection and the touchscreen displays an interface similar to that on your phone. Though the Accord’s touchscreen interface still leaves something to be desired overall, the smartphone interface aspect is much more intuitive and familiar than what is offered in most vehicles. As noteworthy as these updates for 2016 are, however, they only improve a car that was already one of the best all-around family sedans. The Accord continues to impress with its responsive handling, composed ride, abundance of interior room, comprehensive feature set, fuel-efficient yet powerful engines and high crash test scores. The Accord’s solid build quality and reputation for trouble-free ownership further solidify its position as one of our favorite midsize sedans. That said, the Accord isn’t the only excellent choice this year. The 2016 Mazda 6 is the sportiest in the class, with quick acceleration, capable handling and stylish looks. The 2016 Ford Fusion shares those same attributes, while the 2016 Hyundai Sonata takes a more conservative route and delivers impressive value for the money. The 2016 Volkswagen Passat and 2016 Toyota Camry are also attractive choices thanks to their fuel-efficient engines and expansive room for passengers to stretch their legs. But considering how the 2016 Honda Accord does nearly everything right, it should deservedly earn a top spot on your consideration list. The 2016 Honda Accord is available as a midsize sedan and coupe. Four-cylinder sedans come in four trims: LX, Sport, EX and EX-L. Opt for the Accord’s 3.5-liter V6 and two trims are offered: EX-L and Touring. The Accord coupe with the four-cylinder engine comes in LX-S, EX and EX-L, while the V6-equipped version comes only in EX-L and Touring trims. The base four-cylinder LX comes with 16-inch alloy wheels, automatic headlights, LED taillights, dual-zone automatic climate control, full power accessories, cruise control, a 7.7-inch infotainment display, Bluetooth phone and audio connectivity, a rearview camera, a tilt-and-telescoping steering wheel, a height-adjustable driver seat, a one-piece folding rear seat and a four-speaker sound system with a CD player, an auxiliary audio jack, a USB port and Pandora Internet radio control. Opting for the Sport trim brings a bit more horsepower, 19-inch wheels, a rear deck lid spoiler, dual exhaust tips, LED daytime running lights and foglights, cloth seating with leatherette bolsters, an eight-way power driver seat (with two-way power lumbar), a 60/40-split folding rear seat, and a leather-wrapped steering wheel with shift paddles for the continuously variable transmission (CVT). The Accord EX also builds off the LX, but in lieu of the Sport’s features adds 17-inch wheels, LED daytime running lights and foglights, heated mirrors, a sunroof, keyless ignition and entry, remote ignition (with the CVT), the eight-way power driver seat (with two-way power lumbar), Honda’s LaneWatch blind-spot display, a six-speaker sound system with a 7-inch touchscreen interface (the standard 7.7-inch display remains as well), satellite and HD radio and a second USB port. Also standard is smartphone app integration via HondaLink (with smartphone-enabled Aha radio features), Android Auto and Apple CarPlay with Siri Eyes Free voice command functionality. The EX-L trim adds to the EX equipment power-folding mirrors, leather upholstery, driver-seat memory functions, a four-way power passenger seat, heated front seats, an auto-dimming rearview mirror, a more sophisticated rearview camera and an upgraded seven-speaker sound system. As the name suggests, the EX-L V6 adds a six-cylinder engine, as well as dual exhaust tips and steering-wheel-mounted shift paddles. All the above trims can be outfitted with the Honda Sensing package, which includes adaptive cruise control and additional safety features (detailed in the below Safety section). A navigation system is optional for the EX-L and EX-L V6. The range-topping Touring takes the EX-L V6 offerings (minus the paddle shifters) and adds the features from the Honda Sensing package as well as 19-inch wheels, LED headlights (with automatic high beam control), automatic wipers, front and rear parking sensors, a rear deck lid spoiler, heated outboard rear seats and the navigation system. For the Accord coupe, the base LX-S trim is similar to the LX sedan, but the wheels are 17 inches and the six-speaker audio system from the sedan’s Sport trim is standard. The coupe’s EX trims are also comparable to the sedan’s in terms of equipment, though the V6-powered EX-L has 18-inch wheels. 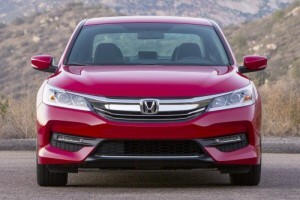 All 2016 Accords are front-wheel drive, and most are fitted with a 2.4-liter four-cylinder engine. This engine is rated at 185 horsepower and 181 pound-feet of torque. The Sport trim level’s less restrictive dual exhaust boosts output to 189 hp and 182 lb-ft of torque. LX, Sport and EX sedans (and LX-S and EX coupes) without the Honda Sensing package come standard with a six-speed manual transmission. Optional for those trims and standard on the rest of the lineup is a CVT, which takes the place of a conventional automatic. With the CVT, all four-cylinder Accords but the Sport trim earn an EPA estimate of 31 mpg combined (27 city/37 highway), while the Sport rates slightly lower, at 30 mpg combined (26 city/35 highway). 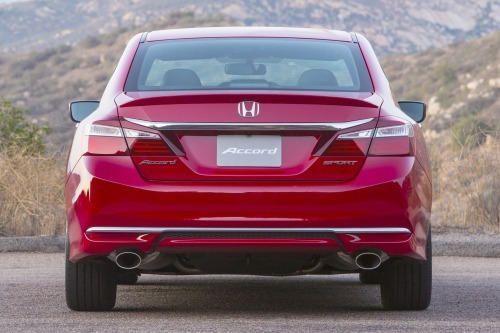 With the manual transmission, the Accord stands at 27 mpg combined (23 city/34 highway). 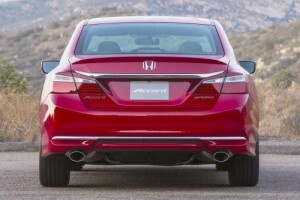 The Accord’s available 3.5-liter V6 is rated at 278 hp and 252 lb-ft of torque. Backed by a conventional six-speed automatic, the sedan V6’s fuel economy numbers are impressive at 26 mpg combined (21 city/34 highway). On the coupe, this combo results in 25 mpg combined (21/32). The EX-L V6 coupe is available with a six-speed manual transmission on the EX-L V6 model, which drops fuel economy ratings to 22 mpg combined (18/28). Even with the base four-cylinder engine and CVT — the most popular powertrain choice for Honda Accord buyers — performance is relatively strong. In Edmunds testing, a four-cylinder Accord EX sedan with the CVT sprinted from zero to 60 mph in 7.8 seconds, a quick time for the class. The V6 is also one of the quickest upgrade engines in the segment: A Touring sedan we tested accelerated to 60 mph in just 6.1 seconds. Every 2016 Honda Accord comes with antilock disc brakes, stability and traction control, active front head restraints, front seat side airbags and side curtain airbags. A rearview camera is also standard across the board. Lane departure warning, lane and road departure intervention, forward collision warning and forward collision intervention with automatic braking are included with the Honda Sensing package (standard on Accord Touring). Standard on EX and above is the LaneWatch blind-spot system, which switches the 7.7-inch screen’s display to a low and wide view of the car’s passenger side when the right turn signal is engaged. In government crash testing, the Accord sedan received five out of five stars for overall protection, with four stars for total frontal impact safety and five stars for total side-impact safety. The coupe earned five stars across the board. The Insurance Institute for Highway Safety gave both body styles the best possible rating of “Good” in its moderate-overlap and small-overlap frontal-offset impact tests, as well as a “Good” rating in the side-impact, roof-strength and seat/head restraint (whiplash protection) tests. In Edmunds testing, an Accord sedan with the V6 engine braked from 60 mph to a stop in 116 feet, one of the shortest stopping distances we’ve recorded for a midsize sedan. With a few exceptions, the materials in the 2016 Honda Accord have a high-quality look and feel. The overall design is elegant, and the cabin’s tight construction gives a much stronger impression than you’d expect from a workaday family car. The new interior trim also helps liven up the dark interior, although we’ve noticed that this trim can reflect the sun into the driver’s eyes. At the top of the dash is the 7.7-inch display that offers varying levels of information. Below that, the base Accord will have simple but effective audio controls, but the EX and above get a touchscreen interface (in addition to the top display). The touchscreen is sleeker-looking, but you lose the traditional tactile buttons (there’s no volume knob, for instance), and the menu structure can be confusing or needlessly complicated at times. Also, going between the Honda and Apple CarPlay or Android Auto systems can be a bit clunky at times. Both front and rear occupants will find plenty of legroom and shoulder room. 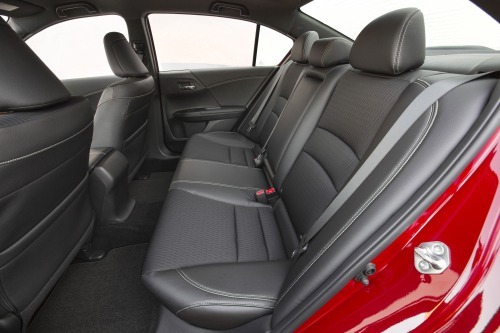 The sedan’s backseat is one of the best in this class, thanks to its combination of space and comfort. Road and tire noise — which in previous Accord generations could be rather annoying — are noticeably subdued. We’re also fond of the clear outward visibility afforded by the fairly low beltline, relatively slim roof pillars and generous amount of glass — all of which are increasingly rare in modern automobiles. As a downside, though, we’ve found the Accord’s front seats less comfortable on long drives than others in this segment. At 15.8 cubic feet, the Accord sedan’s trunk is large but about average, with the coupe’s measuring in at 13.7 cubic feet. Sport and above trims now get a 60/40-split rear seatback that folds down to increase cargo capacity. Most Honda Accord buyers end up choosing the four-cylinder engine, and they won’t be disappointed, as it revs willingly and delivers its power in a smooth and satisfying manner. Although CVTs don’t have the best reputation for refinement, Honda’s unit is the best of the breed, as it responds quickly for swift passing maneuvers and then lets the engine rpm drop back smoothly when the need for quick acceleration has passed. Of course, if you simply don’t like CVTs, you could always get the V6 engine, which comes with a conventional six-speed automatic. The Accord is unexpectedly quick when equipped with the V6, although the inability to choose your own gears on the top Touring trim is a bit of a letdown. The 2016 Honda Accord manages to strike a near-perfect balance between a supple ride and engaging handling. Considering how it’s a big family sedan meant primarily for comfort, it’s all the more impressive that it remains balanced and controlled around turns. The electric-assist power steering might feel pretty light the first time you turn the wheel, but it is precise and has a crisp response that adds to the driving enjoyment. Retuned suspension dampers have also improved the Accord’s ride quality this year, and it deals with rough roads and broken pavement in a more comfortable manner.